Assessed my digital literacy for teaching. Identified a challenge for my learners. Mind-mapped and selected an educational technology to help address this challenge. Developed, obtained feedback and refined a prototype of my technology creation. Connected the technology to my curriculum. Reflected on the design thinking approach used to create a technology-enabled solution for a learning challenge. 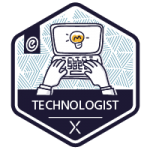 Apply for your Technologist Badge!